There are 2 ways of finding the URL (the website address) of a page on your FASO site. 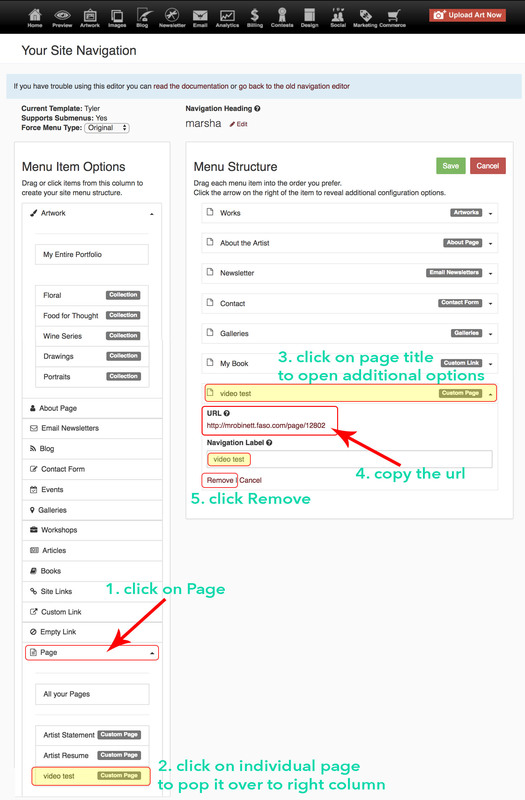 These instructions are specific to finding the url of a Free Form Page but it will work for any page of your site (other than the Home page). after you have copied the URL address, you can Remove the hidden page or just click the red Cancel button at the top. For most pages, you can go to the live website and simply add the page title after the domain name, as follows. NOTE: The pages do not need to be listed as a category in the Nav Bar for this to work. when you go to mydomainname.com/pages, you can access all individual page urls. All pages, whether they are hidden from nav bar or not, show up on the mydomainname.com/pages OVERVIEW screen. Click on each individual page to access the individual page's url. NOTE: This works the same for any individual page (events, books, workshops, etc.). The number of the event, the book, a workshop, etc. will show in the url for the individual listing in the control panel.